Formax 8802 Industrial Conveyor Shredder - Roberts Business Machines, Inc.
Formax 8802 Series Industrial Conveyor Shredders offer high capacity for shredding large volumes of material, and can serve the needs of an entire organization. These shredders are powerful enough to shred just about anything including entire files, stacks of computer forms, cardboard, tapes, CD’s and magnetic disks. The FD 8802CC Cross-Cut model can shred up to 90 sheets at once, at up to 40 feet per minute, with a shred size of 1/4″ x 2″. 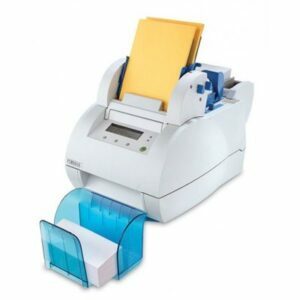 The FD 8802SC Strip-Cut model can shred up to 125 sheets at once, at up to 50 feet per minute, with a shred size of 1/2″.